My kids return to school a week from today. My baby is starting kindergarten, and I keep having dreams that the teacher has to come up to me and tell me it is time to leave, that I can't stay at school with him all day. It isn't pleasant. He is a ton of fun to have around, and I am gonna miss him. On the one hand, I don't want summer to end. Ever. I love taking the kids to the beach, museums, parks, gardens, and swimming pools. I love sleeping in. I love staying in pajamas well past noon. On the other hand, if these kids lose one more pair of flip flops, or make one more mess that they don't want to clean up, or squabble one more time, I might lose my mind. It will be kinda nice to have them all gone, making their messes somewhere else for a few hours a day. It might take a couple of cocktails to get me through the end of summer. Then again, it might take me a couple of cocktails to get me through the first day of school. Either way, I better be prepared. 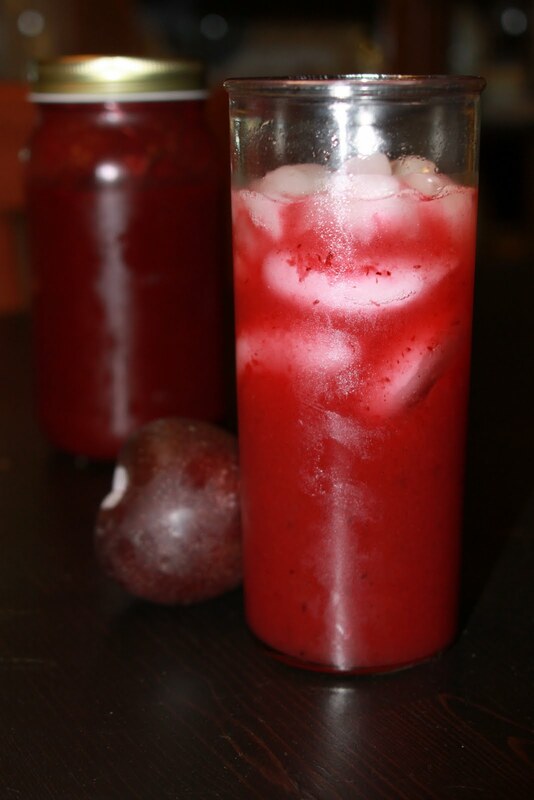 Lucky for me, I found this recipe for Plum Vanilla Syrup. It is a great way to hang on to these last days of summer. This delicious syrup is really quite simple... just vanilla simple syrup and plums. The possibilities for it are endless, though. I used it to make a cocktail, by mixing it with vodka and club soda. You could make a bellini by adding it to Prosecco. Or a kid-friendly, homemade, dye- and corn syrup-free soda by just mixing it with club soda or sparkling water. I can imagine it poured over ice cream, or even pancakes, or drizzled over some toasted pound cake. I got the recipe from The Farmer's Daughter, who happens to be one of the growers who contribute to my Abundant Harvest Organics box, and also blogs about what she does with the stuff she grows. First, slice the vanilla bean lengthwise and scrape the seeds. In a medium saucepan, combine the sugar, water, and vanilla bean. Bring to a boil, lower the heat, and simmer for about 5 minutes. Add the chopped plums and simmer for another 5 minutes. Let it cool. Remove the vanilla bean, and pour the rest into a blender. Puree until smooth. Now, have fun with it. I sure did! in this technological world the whole thing is existing on web? on your post. They're very convincing and can definitely work. Nonetheless, the posts are very short for beginners. May just you please extend them a little from next time? Thanks for the post. awesome job with this. Additionally, the blog loads very fast for me on Safari. Stay up the good work! You already know, many individuals are searching round for this info, you could help them greatly. Feel free to visit my weblog - The greatness in young females is not only in the fact they are fun skinny plus.